AOL Canada and Huffington Post Canada are both experiencing growth according to numbers released by the media group. AOL Inc. moved to the #4 position in the portal category according to August numbers which place the company’s visitor usage at 10 million monthly unique views, a 10 percent increase over July. Conversely The Huffington Post grew 21 percent to 1.9 million unique monthly views. The increase in traffic to both sites comes after the company hired new media experts to help fuel their growth. Among top hires are Vivian Ip, director of agency sales and operations, AOL Canada and Danielle Crittenden as managing blog editor for The Huffington Post Canada. Vivian joins the team from Canoe.ca/QMi Sales where she worked as the sites director of media solutions for two years. Vivian also has more than 17 years in marketing and operations. Crittenden on the other hand is a well known author who’s work has appeared in various publications including: Wall Street Journal, New York Times, Washington Post, Ladies Home Journal, Redbook, The National Post and Reader’s Digest. Huffington Post Canada also recently hired Althia Raj as Ottawa bureau chief, a move she made form Postmedia News where Raj served as the national political reporter for print and online. The sites growth announcement comes less than 10 days after AOL numbers revealed positive growth numbers in the U.S. for the first time in months. 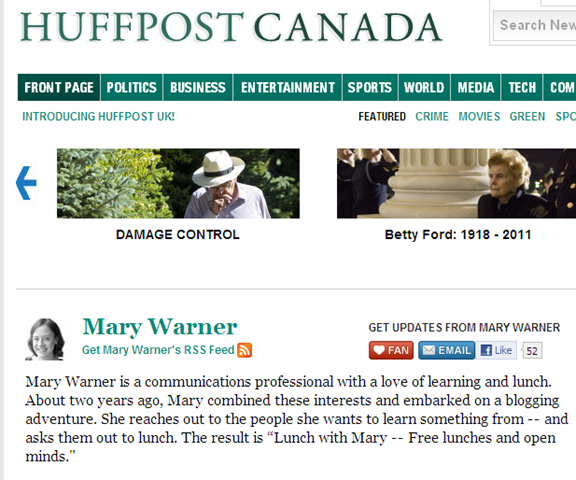 Are you a Canadian reader of the Huffington Post? Let us know what you think about the company’s recent content additions.